The photo of a nearly perfect rectangular iceberg in the Antarctic snapped by NASA’s ICE mission, as part of Operation IceBridge, is sure to fuel those many conspiracy theories of aliens even more. The photo captured by NASA’s ongoing, decades-long survey of polar produced an almost impossibly rectangular iceberg. The huge tabular iceberg borne of the Larsen C ice shelf looks like it was neatly cut from the wider ice shelf using a giant band saw. The general perception is that icebergs are jagged and pointy, with the bulk beneath the surface. 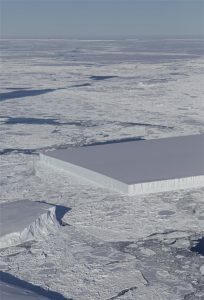 However, flat icebergs are giant slabs of ice with vertical sides that form by splintering off a much larger ice shelf. These particular icebergs occasionally measure thousands of square kilometers across, such as the 11,000 square kilometer (4,200 square mile) B-15, the world’s largest free-floating object ever recorded.